Gem of a box, worthy of displaying sink-side, with a cute name and a perfect brown-y bronze powder inside. The color inside is flat matte, not a sparkle to be found, making it utterly realistic for a range of skin tones. The texture is silky and won't get streaky, as long as you ditch the tiny square brush that comes with it, and use a big powder duster instead. This is a great bronzer. Not too heavy, and it blends well. Better than most bronzers. i hate the packaging but its an amazing matte bronzer, just what i've always wanted! it lasts all day and blends nicely and NEVER looks orange. 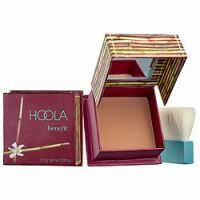 its perfect for contouring as well as giving a nice glow. and even the brush that comes with it is decent. its a very soft brush, not like the average complimentary brushes that you'd throw away. 5 million stars! Everyone raves about this so I finally decided to try it in the Benefit Real Cheeky kit. I like how this bronzer is matte and multifunctional. It has a middle ground of having a cool and warm undertone so it's perfect to contour or bronze (although it falls closer to a gray undertone). This does not look orange at all. I don't like how it's not suited for all skin tones though. I feel like this wo...read moreuld work better for Caucasian skin tones. I have Asian light to medium skin tone and it barely showed up on my skin. It also looked really muddy when I contour in the hollows of my cheeks. I like the silky texture of this and how it lasted a decent amount of time but just didn't like that you can hardly tell I have it on.